The international scientific network now known as Cochrane (formerly the Cochrane Collaboration)—which every year churns out hundreds of influential systematic reviews geared toward health policy-making—is not the type of organization that typically makes news headlines. Of late, however, Cochrane’s vaunted edifice of credibility has been visibly crumbling as the organization deals with mounting questions about whether it is as free from conflicted funding and industry-favorable bias as it likes to claim. 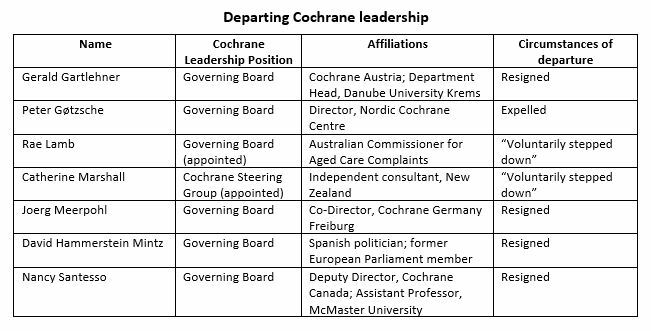 “…The central executive team of Cochrane has failed to activate adequate safeguards…to assure sufficient policies in the fields of epistemology, ethics and morality. Transparency, open debate, criticism and expanded participation are tools that guarantee the reduction of uncertainty of reviews and improve the public perception of the democratic scientific process. These are conditions and tools that cannot be eliminated, as has happened recently, without placing into serious doubt the rigorous scientific undertaking of Cochrane and eroding public confidence in Cochrane’s work” [emphasis added]. According to Gøtzsche, therein lies the rub—accompanying the shift toward a less collaborative and more heavy-handed executive leadership is “stronger and stronger resistance to say anything that could bother pharmaceutical industry interests,” along with “stalling” to avoid strengthening Cochrane´s conflict of interest policies. As Gøtzsche concludes, Cochrane’s increasingly commercial orientation reflects a worrisome erosion of the “sharing, independence and openness” that once were the trademark selling points of the Cochrane Collaboration. CHD is planning many strategies, including legal, in an effort to defend the health of our children and obtain justice for those already injured. Your support is essential to the success of CHD’s mission. Please visit our crowdfunding page.